The damaging oil spill from the Deepwater Horizon rig is making national news and beginning to impact our military community. 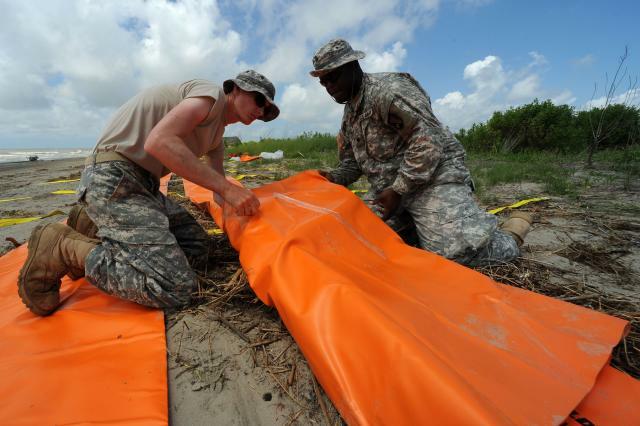 In addition to the US Coast Guard and active duty forces, the National Guard and Reserve forces are now involved as we seek to protect and clean up the Gulf Coast. I met with Major General A.C. Blalock to discuss one state’s National Guard response this afternoon during a DoD Blogger’s Roundtable. According to General Blalock, the state’s Adjutant General, the Alabama National Guard is responding to the Deepwater Horizon Oil Spill catastrophe in the Gulf of Mexico while preparing to protect the economy, resources and way of life of its citizens. With 11,100 soldiers and 2,400 airmen in his organization the general said they were prepared to handle what the Governor may asked them to do in the future. Currently, they have 360 soldiers and 3 airmen on duty helping with the state response by placing oil barriers, manning security checkpoints and providing safety for citizen volunteers. They have also used their helicopters to do reconnaissance and deliver imagery for the leadership involved in the response. With 15% of his force normally in a deployed status under federal jurisdiction in Iraq, Afghanistan and other locations he said the Deepwater Horizon Response is not impacting their ability to support the theatre commanders overseas or other missions at this time. One Air Guard deployment just returned from their Air Expeditionary Force commitment and training continues for other units ahead of their tours as well. The general said the Department of Defense has received funding for the cleanup (BP will eventually be footing this bill according to the law) and there is very strict accounting for mandays and orders were fu nded before being placed in effect (“cut” in military slang). This is different than a hurricane response and helps the government track the total cost of this cleanup! Due to the Gulf Coast states experience with hurricanes they have a good plan for duties in response to the six month plan being developed by the Unified Area Command headed by the US Coast Guard. They also have compacts (agreements) in place between the Guard units in the Gulf area to support each other as needed. Alabama has not seen the damaging impact (their coast is different than Louisiana and farther from the spill). They have seen tar balls but no oil sheen. The general said they were still in the prevention and protection mode versus clean up after a disaster. The state has 4,000 trained volunteers to assist with clean up and the general was clear that his role and the Guard’s role was to support the citizens of Alabama. Thank you sir, for taking the time to talk to me and explaining how the Alabama National Guard was responding to this crisis! If you would like to see more about the Alabama National Guard please go their website here! If you would like to read a transcript of this exchange of information or listen to the Roundtable please go to DoDLive! For further articles/information on the military involvement in the cleanup please go to MilitaryAvenue.com's Reading Room. Articles include my interview with Admiral Mary Landry, the Federal On Scene for the Unifed Area Command! Photo Credit Soldiers with the Louisiana National Guard's 1023rd Vertical Engineering Company, 528th Engineer Battalion, fold interlocking tubing for the Tiger Dam water diversion system, May 20, 2010, near the southwest pass of the Mississippi River delta. The 1023rd VEC is constructing a 7.1-mile barrier in an attempt to prevent any possible oil from coming in to the wetlands. It is about time the military takes over from BP. BP is not managing this well at all. I can't wait to see what their profit is going to be this year.